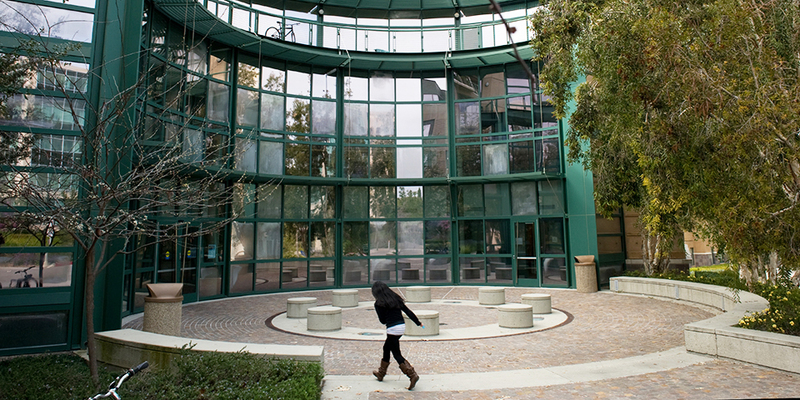 One of the founding academic units established in 1965 at UCI, the School of Physical Sciences has built an international reputation of distinction in scientific research while also embracing the teaching mission of a public university. The school's world-renowned faculty members and research scientists teach and perform research with students to explore the ever-advancing frontiers of knowledge. From the first instant of the big bang to the future of our planet, from imaging individual atoms and molecules to modeling living cells and cancer tumors, and from synthesizing new molecules to the evolution of the universe - our scientists explore all time scales and all size ranges to learn nature's secrets and provide the foundation for the tools used by a modern technological society. The school includes four departments: chemistry, mathematics, physics & astronomy and Earth system science, the first department of its kind in the nation. It enrolls approximately 1,700 undergraduates and 500 graduate students. In 1995, the school garnered international prominence when founding faculty members F. Sherwood Rowland (chemistry) and Frederick Reines (physics) each received the Nobel Prize, making UCI the first public university with faculty receiving the award in two different fields in the same year. Building on this foundation, 11 faculty members have been elected to the National Academy of Sciences. Consistently, professors and students are singled out for prestigious awards recognizing their scientific excellence. The school also takes great pride in the recent rankings by the National Research Council (NRC) that place each of the four departments in the top 15th percentile or better. Over the past decade, its research expenditures have more than doubled. Additionally, the school has earned awards from the Gordon and Betty Moore Foundation, NASA, W.M. Keck Foundation, Clare Boothe Luce Program and others. Professors are not only leading the world in addressing today's problems, they are simultaneously teaching the scientists who will be solving tomorrow's problems. According to a recent survey, 40 percent of our undergraduate students continue their studies in graduate school. As with undergraduate admission, the school's graduate programs become more selective every year. In the last two years, graduate students received an unprecedented 14 National Science Foundation Graduate Research Fellowships. Along with traditional fields of inquiry, the school offers innovative graduate curricula, including programs in chemical & materials physics; mathematical biology; medicinal chemistry & pharmacology; polymer, materials & nanoscience; and atmospheric & environmental science. Dr. Kenneth C. Janda was appointed to his second term as Dean of UC Irvine's School of Physical Sciences in July 2016. During his first term, the school rose in rankings and gained international reputation for excellence in research and teaching. An inspiring educator, Janda works closely with undergraduate and graduate students and provides unique opportunities to work on research projects in his lab. He is a strong supporter of pre-college education and is the UCI Director of the CalTeach program which aspires to train the best-of-the-best K-12 Science Teachers. 11 School of Physical Sciences professors have been elected members of the National Academy of Sciences. More than 40 faculty members have been named Alfred P. Sloan Research Fellows. 3.89 is the average GPA of incoming undergraduate students. Approximately 1,500 undergraduate students and 550 graduate students are enrolled in the School of Physical Sciences. Doctoral degrees are granted from all four departments. Half of the school's undergraduate students conduct research. The Department of Chemistry is one of the nation's largest producers of graduates with B.S. and Ph.D. degrees in chemistry. Earth system science is the first university department in the U.S. dedicated exclusively to understanding the scientific basis of global environmental problems. Earth system science professors regularly inform policy makers on environmental issues. U.S. News & World Report ranked organic chemistry 11th, physical chemistry 12th, and theoretical chemistry 18th in graduate school rankings. Physicists from the school played a key role in the discovery of the Higgs boson particle through their work on the Large Hadron Collider in Geneva, Switzerland. The Department of Mathematics hosts first-tier research programs in pure and applied mathematics, and is strongly committed to education and community outreach. The school offers state-of-the-art research facilities in molecular modeling, mass spectrometry, X-ray crystallography, nuclear magnetic resonance (NMR) spectroscopy, and currently has plans for a world-class electron microscopy facility.